Feb. 23, 2014, 5:44 p.m.
On the issue of income inequality I think we tend to complicate the issue, particularly in the media. The fact of the matter is simpler than that. More and more corporate executives (me included) get a third or more of our compensation in bonus which comes mostly in the form of stock. Our stock becomes more valuable if we meet or beat expectations. We are able to meet or beat by cutting costs and the larger expense we are able to cut is employment. 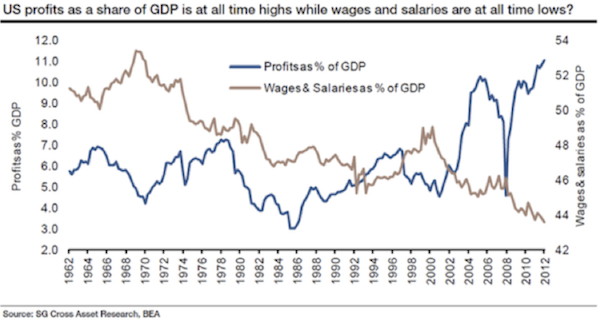 The people that lose their jobs cannot find another that pays as much as a corporate job so they drop in income level. Those that keep our jobs not only do we see us receiving more bonus because we met or exceeded our targets, we also see our stock go up, making us more wealthy and jumping up the income levels. Of course only a few hundred benefit from that at the expense of the thousands that lose their jobs. The solution is simple: if you make your numbers (targets) by cutting jobs you don’t get a bonus. No bonus, zero. If the business grows without cutting jobs then you get you get a bonus. 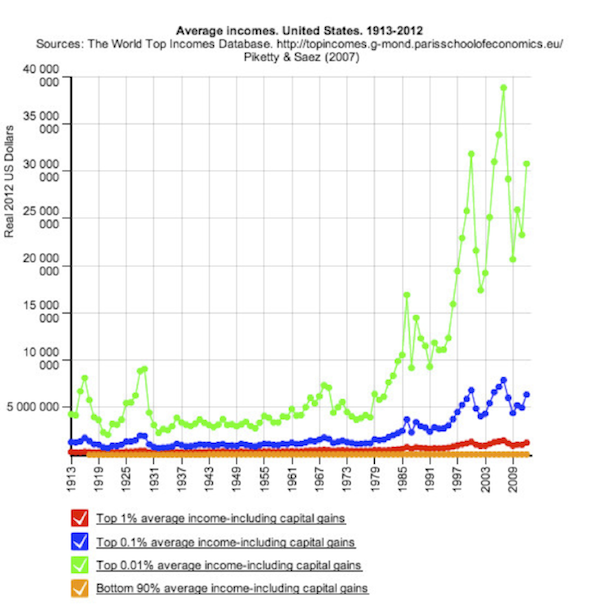 Otherwise we will continue to see a few getting richer over the many that get poorer, hence, income inequality. Feb. 23, 2014, 5:41 p.m. Observing this skill level of more than four fifths of the U.S. population one finds it quite hard to reasonably expect and demand a Gini coefficient close to zero - unless one happens to be a progressive economist. Feb. 23, 2014, 5:13 p.m. I am 5’10” tall. I cease to make distinctions when I am in the presence of people over about 6’3” tall. They are all giants to me. In the same manner, I see no distinction in wealth above a certain point: ultra- super- uber- whatever. The article is well written, but fails to mention the sticking point with those of us of average means. I see the real issue being that many of the really wealthy among us achieved that status, not by coming up with a better mousetrap, but by high finance mechinations that have no visible or real value to the rest of us. So mixed in with Zuckerberg and Musk, are Bloombergs, Madoff, and Dimon. Feb. 23, 2014, 4:23 p.m. Growing income inequality derives from policies that benefit big business and large institutions at the expense of small and medium size (less than 1000 employee) businesses. The problem is not capitalism, as the left likes to frame it, but “crony-capitalism” in which both the left and right participate equally. Ironically, it is the unholy union of businesses, unions and left-leaning big government that are the principle source of income inequality. How so? Massively increased regulation (SOX, EOE, OSHA, etc) forces small companies to merge, dissolve or never get off the ground. Such regulation is a principle driver of business consolidation as it is a source of “productivity” as fixed regulatory costs are spread over more employees. This push for productivity causes job elimination increasing unemployment, another irony of excessively regulated businesses. Big business makes regulatory concessions to the government, through the lobby process, knowing jobs can be moved offshore as added regulations add financial burden and cost to a business. Small companies do not have the option of moving offshore. 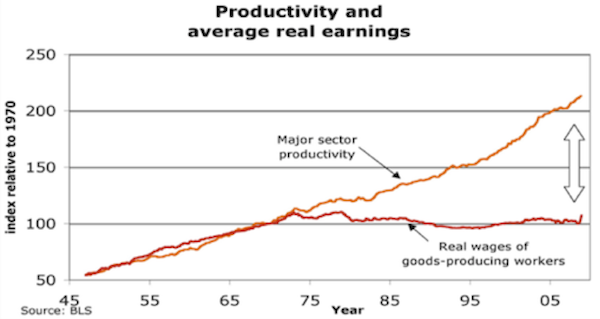 The bigger and more burdensome becomes the government, the explicit goal of the Left, the greater the income inequality as wages stagnate and middle income jobs disappear. Those who complain about the “do-nothing” Congress, should instead be giving thanks to legislators who refuse to add more oppressive regulation. Feb. 23, 2014, 3:43 p.m. I believe much of the heat would leave the inequality issue if the tax code were not so unfair. People generally have finally caught on to the outrageous tax advantages available to the extremely wealthy. If the tax system was generally viewed as fair, income inequality would be acceptable to far more people…and the political landscape would change. Feb. 23, 2014, 3:41 p.m. 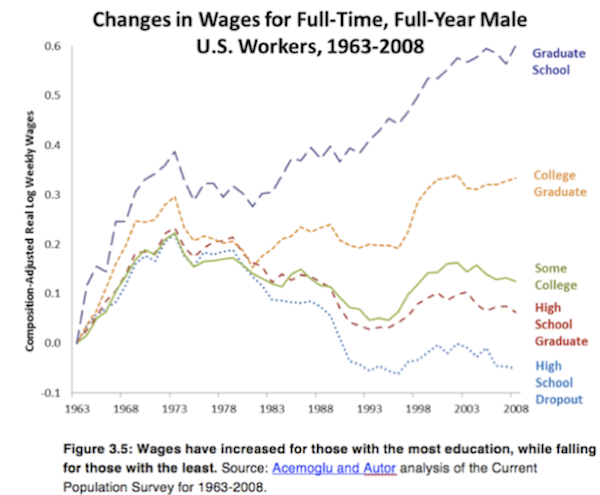 While there is no doubt that incomes are growing unequally relative to how they have grown in the past 200 years, as you pointed out, highly educated workers are utilizing their educations to capture those gains. This seems neither surprising nor unfair in any manner. And while I agree with your thesis that the education system must adapt, I would ask the following question: If our education system is failing in its stated goal of adequately teaching our children to be effective citizens and employees in the evolving economy, why has there been so little outcry over the obvious management failures in the education system? I think you would agree that if public education was a listed company, it’s management would have been run out of town a long time ago. So what makes this group of managers so special that they are entitled to not only fail spectacularly every year, but to demand more money for their business as well? It is unrealistic to expect that everyone will be able to take part equally in the changing needs of our increasingly knowledge based economy. After all, not everyone has the same skill set or intelligence levels to begin with. The distribution of talents amongst humans is vast, and it appears that public education is failing badly at helping those in the left half of the distribution achieve their highest opportunities. Let’s question the educators and find out why they are not doing the job? Feb. 23, 2014, 2:58 p.m.
Liberal Americans wish to make political hay with this matter but they fail to realize that nearly all Americans are the 1 % from a worldly perspective. We are the richest Nation on earth and even a low income worker in America is the in the top 1 % from an international perspective. So before the liberals start talking about redistributing wealth they should ask themselves how much they are going ask each American to give up to the rest of the world. Prosperity comes from growing the pie not from stealing someone elses piece of the pie. Be safe on your travel-love your writings and Code Red ! Feb. 23, 2014, 2:43 p.m.